Want to develop entertainment app? In this blog Know, why bitmoji can be the best option for entertainment and to earn money. Entertainment and utility apps have always been on the top list in terms of downloads. People wish to keep themselves updated with the latest trends in entertainment and utilities. Most of us are active on social media and everyone is very much familiar with emoticons. The emoticons coming to life via entertainment app development have made communication interesting and have enabled people to let the other person know their exact feeling either through facial expression emoticon or some stickers. Most of the social media apps like Facebook and Snapchat add emoticons and stickers to their platforms to make social media interaction effective and interesting. The Bitmoji app has been around for quite some time. People are using these engaging avatars to communicate everywhere. They use these avatars in the office, in the dating world, while texting and while they don’t actually feel giving a proper textual reply. We find people discussing and highlighting Bitmojis on Twitter, Instagram, Snapchat and even on the morning talk shows. Millions of people have been using the Bitmoji app every single day. Let us discuss why such apps like Bitmoji for iPhone are adored and admired by people and how the creators of such apps make huge bucks. Bitmoji is a spin-off app and a product by Bitstrips which was co-developed by Jack Blackstock, a Toronto-based comic artist and his friend Jesse Brown. They previously wanted to help people make their own comic stories even without actually being very good at art. They wanted to create an app which was the groundwork for a completely new way of communication. And they made Bitstrips as a medium of expression by letting people create short comic stories on their own with fun. They made the pictures speak really louder than words. Bitstrips gained more than 10 million users very soon and it became so popular that when Facebook launched the stickers and emojis, people referred to them as Bitmojis. Bitmoji was launched in October 2014. Bitmoji app is free and allows the users to send a personalized avatar to their friends and family on different chat programs. There are many customization options that allow you to nail down your appearance. One can change the color of hair, eye color, size, eyebrows and even the clothes that show up when the user sends the avatar to someone. The users can send the expressions of happiness, dread, optimism and many more. Bitmoji allowed users to create stickers in various templates. Later in July 2016, it was announced that Snapchat had acquired Bitstrips and the though the company was closed, Bitmoji owned their focus. Snapchat app integrated with Bitmoji app and allowed the users the best of two apps. In 2017, Bitmoji was introduced with Snapchat’s augmented reality technology in 3D. It was reported as the most downloaded app on the iPhone in April 2017. 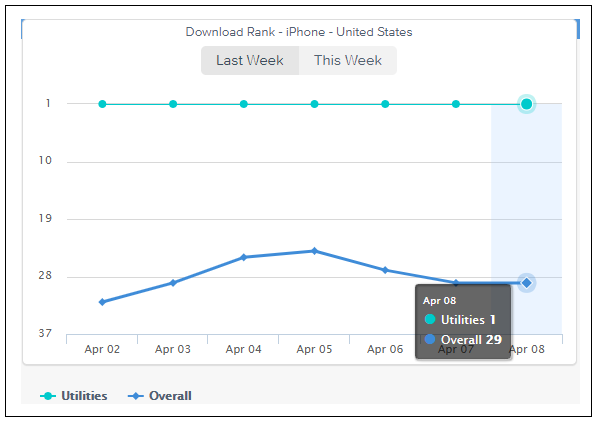 Today, the app has more than 100+ millions of downloads and the app ranks second on Apple’s leaderboard. Here is a chart in support of the fact. 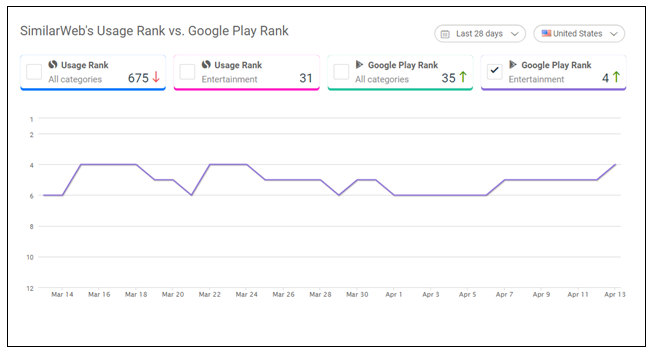 The below graph from Similarweb shows that the Bitmoji app ranks 31st in the entertainment industry, 35th in Google play rank among all categories and it stands 4th in the entertainment app category. Below is a graph from App Annie. 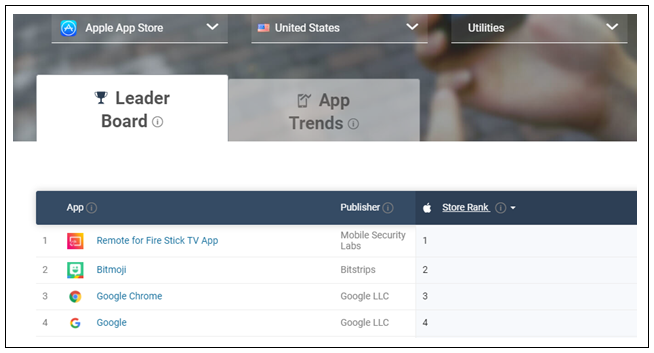 It shows the ranking of Bitmoji app in the Utility category and overall. It can be seen that the Bitmoji app ranks 1st in the utility category and ranks 29th overall. This is according to last week’s statistics. Why should you develop entertainment app or create an app like Bitmoji? In today’s life, the division between your real life and digital life is almost nil. Both the worlds are merging together into the same making the digital representation of yourself and your expressions necessary to interact with people around. An avatar means an incarnation. Using a Bitmoji avatar helps you to put a version of yourself into another realm. An avatar is actually a digital identity which you create for yourself through the Bitmoji app. This avatar can be used all over the social media to depict your presence. You can customize your avatar with the in-app purchases that bring new expressions to it. There is a huge library of your own avatars made available to use. Snapchat has released Bitmoji Kit, a simple tool that let’s other app developers integrate the avatars into their own software. Now, the Bitmoji images can be sent to the Tinder matches to make a cool first impression. With the growth in AR and VR world, the use of avatars to represent people is growing day by day. The Bitmoji app is copied by Apple and Facebook in order to stay in the competition and offer something new to people. The avatars have become an integral part of the society with their increased use on most of the social networking sites. Since you cannot show your facial expressions while communicating online, using the avatars in the right way can prove to be a real game-changer for being your medium of expression. Slowly, the avatars are even being added to various transportation apps and classroom communication apps like ClassDojo, which allows the children to make their own avatars on their ClassDojo profiles and lets the teacher grade them. These apps are even used in businesses to have an avatar for each employee. Basically, the Bitmoji app is not just any other app used for fun. It is an app which ensures you have a cuter digital identity and do not get lost within the sea of people online. A closer look towards this app and its popularity can ensure you that such entertainment/ utility apps are here to stay. They have a lot of scope to stand-by or integrate with other apps. How much does it cost to develop entertainment app like bitmoji? If this strikes a chord in your heart and you are convinced to create an app like Bitmoji, the first this that comes to your mind is regarding the cost of development. The cost of an entertainment app development is based on the features that you wish to include in the app and the time required to develop the app. If you have a basic idea about how you wish your app to function, we can help you validate it through a free consultation. Connect with us via the contact us form and allow us to develop a really cool entertainment app for you which will earn you a huge sum of money and a big number of downloads too.